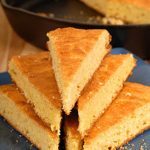 Love cornbread? Or just want a taste of the ‘real south’? 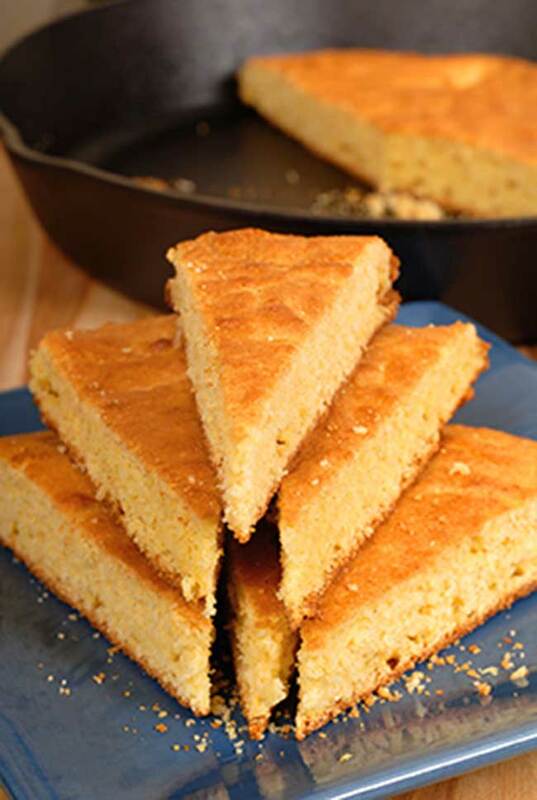 This perfect everytime southern buttermilk cornbread is what you need ! First you need to invest in a southern cook’s go to tool. A 9″ cast iron skillet! Season it well (don’t depend on preseasoning to get you through) and then purchase only the finest creamery butter and buttermilk. Don’t skimp on the basics! I’ve used this recipe for years (it came from my Aunt Dot) and its foolproof! Perfect Cornbread every time ! (Personally I skip the sugar, because I just don’t like sweet cornbread, some do). Give it a print! And let us know how your cornbread comes out! Melt butter in cast iron skillet and pour into glass measuring cup or bowl. Using what's left in the skillet lightly grease and heat in oven 5 minutes. Meanwhile, whisk together flour, cornmeal, baking powder, salt in a bowl. Whisk eggs in seperate bowl and whisk into buttermilk. Whisk into the dry mixture until just smooth. Adding whisked eggs to the buttermilk first makes for quick mixing of the dry ingredients. Hot Butter added to the batter is the secret key for perfectly browned cornbread! Time to get some good ole cast iron and whip up a batch Maureen! Looks absolutely delicious. ..12″ or 10″ cast iron? My cast-iron is a vintage pan and I think its a little more than 9″ so a 10″ pan would work. Or if you’re fortunate enough to have one of the ‘square’ cornbread pans, that’s the one to use! Thanks for stopping by!